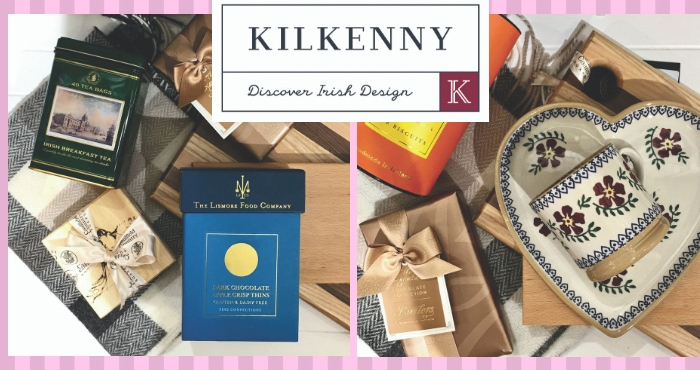 To celebrate the launch of Kilkenny’s homegrown talent event, Scéal: A Story of Irish Design, we have a Kilkenny food and homeware hamper worth €400 to give away! The food and homeware hamper includes Butler’s Chocolates, Lismore Food Company Biscuits, Kilkenny jams and curds, a Caulfield Country Boards cheese board, a cutting board, Bearded Man Wine Opener, Pizza Cutting Bar and a selection of Nicholas Mosse Pottery. Scéal is a celebration of the unique relationship that Kilkenny has with its makers; for decades, the retailer has been dedicated to telling the stories behind each of their crafts, understanding that each narrative is as individual as the pieces themselves. Kilkenny prides itself on having been the home of Irish craft and design for over 50 years, and houses one of Ireland’s largest collections of Irish designers. They also have an incredible Irish food offering, providing wholesome food using all locally sourced ingredients in their Nassau Street, Dublin and Shanagarry, Cork restaurants. The Nassau Street eatery over the Kilkenny shop has been part of the Dublin food scene since the 1970s, with its Potters Breakfast and gluten-friendly scones becoming local favourites. Eating a delicious brunch while listening to the sweet sounds of jazz is a must-try at Kilkenny’s Jazz Sundays at the Nassau Street location. The Kilkenny Shop in Shanagarry, Cork is surrounded by stunning views and overlooks the Ballycotton Lighthouse and Bay. The restaurant scooped the prestigious title of Best Restaurant in East Cork at the Chernobyl Children’s Trust Fundraiser, and the ‘Trip Advisor 2013 Certificate of Excellence Award’. Next articleWin a sumptuous afternoon tea at Lough Erne resort!